Today’s Guest: Lee Roy Selmon, NFL and Tampa Bay Buccaneers football legend, banker, University of South Florida assistant athletic director, and restaurateur. Mr. Media is recorded live before a studio audience that really needs to learn to use utensils when eating Mama’s Meatloaf… in the new new media capitol of the world… St. Petersburg, Florida! One of my favorite newspaper profiles was the day I got to hang out with former Tampa Bay Buccaneer and future NFL Hall of Famer Lee Roy Selmon at his lakefront home in Tampa. I couldn’t get over how this gentle bear of a man could have ever been responsible for knocking other grown men on their asses for a living. This guy? He was one of the best – if not the best – of his generation. But Lee Roy Selmon was also one of the smartest guys in the lockerroom and he’s become a legend in the Tampa Bay area for reasons far from the old Sombrero. There was Lee Roy Selmon the banker, followed by Selmon the associate athletic director at the University of South Florida. When he was ultimately promoted to head athletic director, he helped shape a football program that rose from obscurity to a spot in the Big East conference. In 2000, Selmon – who has a major Tampa Expressway named in his honor — got involved with the founders of Tampa-based Outback Steakhouse and launched Lee Roy Selmon’s a barbecue and homestyle cooking restaurant and sports bar. He left OSI a few years back, but the Selmon’s chain has remained strong and still has financial ties to two of the Outback founders. 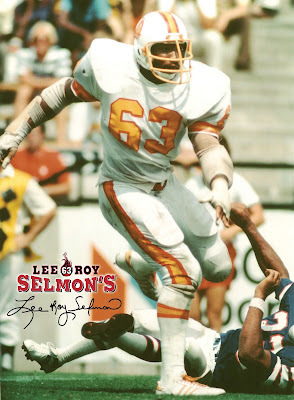 This Monday, June 13, Lee Roy is hosting a special grand opening of his seventh branded Lee Roy Selmon’s restaurant, this one in Palm Harbor, Florida. If you’ve never been, stop by soon for a taste. I can personally recommend the Smokin’ Quesadillas appetizer, the Hall of Fame Ribs and the Georgia Peach Cobbler.